Recent articles in Science and BBC News highlight the budgetary struggles European governments are facing with economic downturn, and how this is affecting the ExoMars mission. The current plan delays the 2013 launch date until 2016. Researchers in California are reporting development of a fast, inexpensive test suitable for home use that could help millions of people avoid those ‘out of the blue’ headaches that may follow consumption of certain red wines, cheese, chocolate, and other aged or fermented foods. The test is designed to detect the presence of so-called biogenic amines, naturally occurring toxins that can trigger a wide range of symptoms in sensitive individuals —from nasty headaches to life-threatening episodes of high-blood pressure. Existing tests for biogenic amines can take several hours, are cumbersome and require large, expensive instruments found only in laboratories, the researchers say. The new test, based on lab-on-a-chip technology, could produce results within five minutes, they state. It will be described in the Nov. 1 issue of ACS’ Analytical Chemistry, a semi-monthly journal. Biogenic amines include tyramine, histamine, and phenylethylamine, which have been known to cause nausea, headaches, and respiratory disorders. These toxins can be particularly dangerous in people with reduced monoamine oxidase (MAO) activity or those taking MAO inhibitors, an older class of antidepressant medications, because they can potentially interact and cause dangerously high blood pressure. Having a quick testing kit could ultimately save lives in these individuals, Mathies suggests. The new technique, called portable microchip capillary electrophoresis, involves labeling the sample with a fluorescent dye, separating the components by applying an electric field on a special microchip, and analyzing the pattern of light produced by the sample upon exposure to a laser beam. In the study, Mathies and colleagues used a prototype device to analyze tyramine and histamine concentrations in a variety of wines (both red and white), beer and sake. They found that the device accurately measured the biogenic amines present in the beverages in less than five minutes. The highest levels of tyramine were found in red wine, and the highest levels of histidine were found in sake, the researchers note. The beer tested contained only small amounts of these biogenic amines, they say. Besides beverages, the test can be used for a wide range of food products, including cheese, chocolate, fish and even sauerkraut. In addition to being used by consumers in the home, the device could be used by industry as a quick method to monitor or limit the biogenic amine content of foods and beverages, according to the researchers. It can also be used to screen foods that have been deliberately contaminated, they say. Mathies envisions that the test will eventually be engineered into a PDA or other handheld device that consumers can use at home or in a restaurant to instantly screen a food or beverage sample for the presence of these toxins. More research is needed before this occurs, he says. The study was funded, in part, by the National Aeronautics and Space Administration. The analyzer was originally developed to look for organic molecules, particularly amino acids, on future explorations of Mars. A version of the sensor has been developed for use in the European Space Agency’s 2013 ExoMars mission, Mathies says. Analysis of Neuroactive Amines in Fermented Beverages Using a Portable Microchip Capillary Electrophoresis System, Jayarah, C. N., Skelley, A. M., Fortner, A. D. and Mathies, R. A., Analytical Chemistry, 2007, 79, 8162-8169. On Monday, NASA announced $750,000 in funding for development of an instrument to detect signs of life on Mars proposed by a scientist at Scripps Institution of Oceanography at UC San Diego. The instrument is designed to provide the most rigorous analysis possible for the past and present existence of biological compounds on Mars’ surface, according to Jeffrey Bada, at professor at Scripps and lead investigator on the project team. Other principal scientists are Richard Mathies of UC Berkeley and Frank Grunthaner of NASA’s Jet Propulsion Laboratory in Pasadena as well as researchers at NASA’s Ames Research Center in Menlo Park and the Leiden Institute of Chemistry in the Netherlands. Named after the late Nobel Laureate and UC San Diego scholar Harold C. Urey, the Urey Mars Organic and Oxidant Detector will perform the first search for key classes of organic molecules in the Martian environment using state-of-the-art analytical methods at part-per-trillion sensitivities. The Viking landers in the 1970s unsuccessfully tested for organic molecules on Mars, but their sensitivity was so low that they would have failed to detect life even if there were a million bacteria per gram of soil. Urey has been selected for the European Space Agency’s ExoMars rover mission, a Mars exploration mission scheduled for launch in 2013 that will focus on exobiology, the science of life in space and on other planets. ExoMars will include a highly mobile rover with a drill capable of extracting soil samples two meters below the Mars surface. A compact instrument that you can hold in your hand, Urey will search for trace levels of organic molecules, such as amino acids and some of the components of DNA and RNA, by heating and analyzing spoon-sized amounts of Martian soil. The molecules released from the heating are condensed on a trap cooled to Mars’ night time temperature, and then probed with a laser. If amino acids are detected, the microfabricated capillary electrophoresis or μCE instrument developed at Berkeley examines the amino acid composition and chirality, or “handedness,” of the molecules to determine whether they come from biological sources. Non-biological amino acids contain nearly equal amounts of left- and right-handed forms, while those from organic matter exhibit excessive amounts of one hand or the other. Amino acids on Earth use only left-handed amino acids. Bada indicated that digging deep into the Martian soil is vital to the mission since ultraviolet and cosmic radiation have likely eliminated any potential indications of life on the planet’s surface. Scripps Institution of Oceanography, at UC San Diego, is one of the oldest, largest and most important centers for global science research and graduate training in the world. The National Research Council has ranked Scripps first in faculty quality among oceanography programs nationwide. Now in its second century of discovery, the scientific scope of the institution has grown to include biological, physical, chemical, geological, geophysical and atmospheric studies of the earth as a system. Hundreds of research programs covering a wide range of scientific areas are under way today in 65 countries. The institution has a staff of about 1,300, and annual expenditures of approximately $140 million from federal, state and private sources. Scripps operates one of the largest U.S. academic fleets with four oceanographic research ships and one research platform for worldwide exploration. Elements of the Urey instrument include the Mars Oxidant Instrument (MOI), the Mars Organic Detector (MOD), the MicroCapillary Electrophoresis Instrument and the Sub-critical Water Extractor (SCWE). 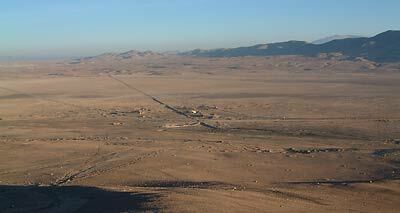 WASHINGTON - On Monday, NASA selected for concept study development two proposals for future robotic missions to Mars. These missions would increase understanding of Mars' atmosphere, climate and potential habitability in greater detail than ever before. In addition, NASA also will fund a U.S. scientist to participate in a proposed European Mars mission as well as fund instrument technology studies that could lead to further contributions to future Mars missions. Each Mars mission proposal will receive initial funding of approximately $2 million to conduct a nine-month implementation feasibility study. Following these detailed mission concept studies, NASA intends to select one of the two proposals by late 2007 for full development as a Mars Scout mission. The mission developed for flight would have a launch opportunity in 2011 and cost no more than $475 million. * Mars Atmosphere and Volatile Evolution mission, or MAVEN: The mission would provide first-of-its-kind measurements and address key questions about Mars climate and habitability and improve understanding of dynamic processes in the upper Martian atmosphere and ionosphere. The principal investigator is Bruce Jakosky, University of Colorado, Boulder. NASA's Goddard Space Flight Center, Greenbelt, Md., will provide project management. * The Great Escape mission: The mission would directly determine the basic processes in Martian atmospheric evolution by measuring the structure and dynamics of the upper atmosphere. In addition, potentially biogenic atmospheric constituents such as methane would be measured. The principal investigator is Alan Stern, Southwest Research Institute, Boulder, Colorado. Southwest Research Institute, San Antonio, will provide project management. NASA has selected Alian Wang of Washington University, St. Louis, to participate as a member of the science team for the European Space Agency's ExoMars mission. Wang will receive approximately $800,000 to study the chemistry, mineralogy and astrobiology of Mars using instrumentation on the ExoMars mission, scheduled for launch in 2013. * Urey Mars Organic and Oxidant Detector: The Urey instrument would investigate organics and oxidant materials on Mars using three complementary detection systems. The principal investigator is Jeffrey Bada, University of California at San Diego. * Mars Organic Molecule Analyzer, or MOMA: The instrument would investigate organic molecular signatures and the environment in which they exist using a mass spectrometer and gas chromatograph. The principal investigator is Luann Becker, University of California at Santa Barbara. These selections were judged to have the best science value among 26 proposals submitted to NASA in August 2006 in response to an open announcement of opportunity. NASA's Mars Exploration Program seeks to characterize and understand Mars as a dynamic system, including its present and past environment, climate cycles, geology and biological potential. The Mars Exploration Program Office is managed by NASA's Jet Propulsion Laboratory, Pasadena, Calif., for the Mars Exploration Program, Science Mission Directorate, Washington. New Rochelle, December 12, 2006 – The Mars Organic Analyzer (MOA), a portable capillary electrophoresis instrument, combined with state-of-the-art fluorescent labeling technology, can detect a much broader spectrum of organic compounds than was previously possible, and these could serve as key biomarkers of extinct or existing life on Mars, according to a report in the December 2006 issue (Volume 6, Number 6) of Astrobiology, a peer-reviewed journal published by Mary Ann Liebert, Inc. The report is available free online at www.liebertpub.com/ast. Recent observations based on the findings of remote sensing devices and robotic probes that have explored the martian surface suggest that liquid water is, or at least was at some time, present on Mars. This has revitalized efforts to search for evidence of extinct or existing life forms. Critical to this effort is the availability of highly sensitive instruments capable of detecting very small quantities of the building blocks or degradation products of microbial life forms. Alison Skelley, H. James Cleaves, Christine Jayarajah, Jeffrey Bada, and Richard Mathies, from the University of California, Berkeley, and the Scripps Institution of Oceanography at the University of California at San Diego, demonstrated that the microchip capillary electrophoresis (CE)-based Mars Organic Analyzer was able to detect and analyze with high sensitivity a greatly expanded range of target analytes, in a paper entitled, "Application of the Mars Organic Analyzer to Nucleobase and Amine Biomarker Detection." The authors compared different extraction techniques--including hydrolysis and sublimation--to isolate analytes from bacteria. They utilized fluorescamine labeling to identify amine-containing biomarker compounds, including amino acids, amino sugars, and nucleobases. "The groups success in applying the MOA to the analysis of a wider variety of organic biomarker compounds is an important advancement of this component of the Urey Instrument, which is being developed for the ESA ExoMars Mission scheduled to launch in 2013," says journal Editor-in-Chief, Sherry L. Cady, Ph.D., Associate Professor in the Department of Geology at Portland State University. 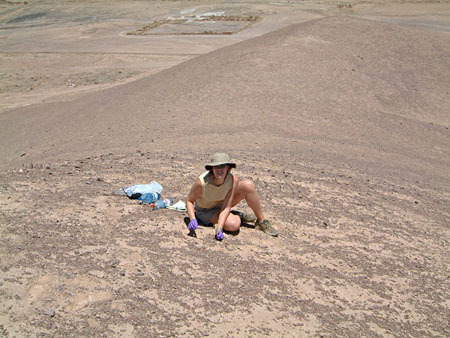 To learn more about the group's efforts to find life on Mars, visit their website at http://astrobiology.berkeley.edu. Astrobiology is the leading peer-reviewed journal in its field. To promote this developing field, the Journal has teamed up with The Astrobiology Web to highlight one outstanding paper per issue of Astrobiology. This paper is available free online at www.liebertpub.com/ast and to visitors of The Astrobiology Web at www.astrobiology.com. Astrobiology is an authoritative peer-reviewed journal published quarterly in print and online. The Journal provides a forum for scientists seeking to advance our understanding of life's origins, evolution, distribution and destiny in the universe. Table of contents and a free sample issue may be viewed online at www.liebertpub.com/ast. Mary Ann Liebert, Inc., is a privately held, fully integrated media company known for establishing authoritative peer-reviewed journals in many promising areas of science and biomedical research. Its biotechnology trade magazine, Genetic Engineering News (GEN), was the first in its field and is today the industry's most widely read publication worldwide. A complete list of the firm's 60 journals, books, and newsmagazines is available at www.liebertpub.com. BERKELEY - The dry, dusty, treeless expanse of Chile's Atacama Desert is the most lifeless spot on the face of the Earth, and that's why Alison Skelley and Richard Mathies joined a team of NASA scientists there earlier this month. The University of California, Berkeley, scientists knew that if the Mars Organic Analyzer (MOA) they'd built could detect life in that crusty, arid land, then it would have a good chance some day of detecting life on the planet Mars. 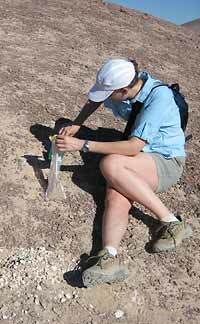 UC Berkeley graduate student Alison Skelley sampling at the Rock Garden site in the Atacama Desert. In a place that hadn't seen a blade of grass or a bug for ages, and contending with dust and temperature extremes that left her either freezing or sweating, Skelley ran 340 tests that proved the instrument could unambiguously detect amino acids, the building blocks of proteins. More importantly, she and Mathies were able to detect the preference of Earth's amino acids for left-handedness over right-handedness. This "homochirality" is a hallmark of life that Mathies thinks is a critical test that must be done on Mars. "We feel that measuring homochirality - a prevalence of one type of handedness over another - would be absolute proof of life," said Mathies, professor of chemistry at UC Berkeley and Skelley's research advisor. "We've shown on Earth, in the most Mars-like environment available, that this instrument is a thousand times better at detecting biomarkers than any instrument put on Mars before." The instrument has been chosen to fly aboard the European Space Agency's ExoMars mission, now scheduled to launch in 2011. The MOA will be integrated with the Mars Organic Detector, which is being assembled by scientists directed by Frank Grunthaner at the Jet Propulsion Laboratory (JPL) in Pasadena together with Jeff Bada's group at UC San Diego's Scripps Institution of Oceanography. Skelley, a graduate student who has been working on amino acid detection with Mathies for five years and on the portable MOA analyzer for the past two years, is hoping to remain with the project as it goes through miniaturization and improvements at JPL over the next seven years in preparation for its long-range mission. In fact, she and Mathies hope she's the one looking at MOA data when it's finally radioed back from the Red Planet. "When I first started this project, I had seen photos of the Martian surface and possible signs of water, but the existence of liquid water was speculative, and people thought I was crazy to be working on an experiment to detect life on Mars," Skelley said. "I feel vindicated now, thanks to the work of NASA and others that shows there used to be running liquid water on the surface of Mars." "The connection between water and life has been made very strongly, and we think there is a good chance there is or was some life form on Mars," Mathies said. "Thanks to Alison's work, we're now in the right position at the right time to do the right experiment to find life on Mars." Mathies said that his experiment is the only one proposed for ExoMars or the United States' own Mars mission - NASA's roving, robotic Mars Science Laboratory mission - that could unambiguously find signs of life. The experiment uses state-of-the-art capillary electrophoresis arrays, novel micro-valve systems and portable instrument designs pioneered in Mathies' lab to look for homochirality in amino acids. These microarrays with microfluidic channels are 100 to 1,000 times more sensitive for amino acid detection than the original life detection instrument flown on the Viking Landers in the 1970s. 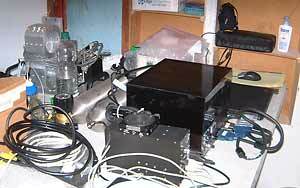 The capillary electrophoresis instrument of the Mars Organic Analyzer (right) and the subcritical water extractor, both of which together form the Mars Astrobiology Probe being assembled by UC Berkeley, JPL and Scripps. The Atacama Desert was selected by NASA scientists as one of the key spots to test instruments destined for Mars, primarily because of its oxidizing, acidic soil, which is similar to the rusty red oxidized iron surface of Mars. Skelley and colleagues Pascale Ehrenfreund, professor of astrochemistry at Leiden University in The Netherlands, and JPL scientist Frank Grunthaner visited the desert last year, but were not able to test the complete, integrated analyzer. This year, Skelley, Mathies and other team members carried the complete analyzers in three large cases to Chile by plane - in itself a test of the ruggedness of the equipment - and trucked them to the barren Yunguy field station, essentially a ramshackle building at a deserted crossroads. With a noisy Honda generator providing power, they set up their experiments and, with six other colleagues, tested the integrated subcritical water extractor together with the MOA on samples from popular test sites such as the "Rock Garden" and the "Soil Pit." One thing they learned is that with low environmental levels of organic compounds, as is likely to be the case on Mars, the microfluidic channels in the capillary disks don't get clogged as readily as they do when used to test samples in Berkeley with its high bioorganic levels. That means they'll need fewer channels on the instrument that travels to Mars, and the scanner used to read out the data needn't be as elaborate. This translates into a cheaper and easier way to build instruments, but more importantly, an instrument that is smaller and uses less power. With the success of this crucial field test, Skelley and Mathies are eager to get to work on a prototype of their instrument that would fit in the allowed space within the ExoMars spacecraft. "I'm much more optimistic that we could detect life on Mars, if it's there," Mathies said. BERKELEY - The same cutting-edge technology that speeded sequencing of the human genome could, by the end of the decade, tell us once and for all whether life ever existed on Mars, according to a University of California, Berkeley, chemist. Richard Mathies, UC Berkeley professor of chemistry and developer of the first capillary electrophoresis arrays and new energy transfer fluorescent dye labels - both used in today's DNA sequencers - is at work on an instrument that would use these technologies to probe Mars dust for evidence of life-based amino acids, the building blocks of proteins. Institution of Oceanography hope to build a Mars Organic Analyzer to fly aboard NASA's roving, robotic Mars Science Laboratory mission and/or the European Space Agency's ExoMars mission, both scheduled for launch in 2009. The ExoMars proposal is in collaboration with Pascale Ehrenfreund, associate professor of astrochemistry at the University of Leiden in The Netherlands. The Mars Organic Analyzer, dubbed MOA, looks not only for the chemical signature of amino acids, but tests for a critical characteristic of life-based amino acids: They're all left handed. Amino acids can be made by physical processes in space - they're often found in meteorites - but they're about equally left- and right-handed. If amino acids on Mars have a preference for left-handed over right-handed amino acids, or vice versa, they could only have come from some life form on the planet, Mathies said. "We feel that measuring homochirality - a prevalence of one type of handedness over another - would be absolute proof of life," said Mathies, a UC Berkeley member of the California Institute for Quantitative Biomedical Research (QB3) . "That's why we focused on this type of experiment. If we go to Mars and find amino acids but don't measure their chirality, we're going to feel very foolish. Our instrument can do it." The MOA is one of a variety of instruments under development with NASA funding to look for the presence of organic molecules on Mars, with final proposals for the 2009 mission due in mid-July. Mathies and colleagues Jeffrey Bada of Scripps and Frank Grunthaner of JPL, who plan to submit the only proposal that tests for amino acid handedness, have put the analyzer to the test and shown that it works. The details of their proposal are now on the Web at http://astrobiology.berkeley.edu. In February, Grunthaner and UC Berkeley graduate student Alison Skelley traveled to the Atacama desert of Chile to see if the amino acid detector - called the Mars Organic Detector, or MOD - could find amino acids in the driest region of the planet. The MOD easily succeeded. However, because the second half of the experiment - the "lab-on-a-chip" that tests for amino acid handedness - had not yet been married to the MOD, the researchers brought the samples back to UC Berkeley for that part of the test. Skelley has now successfully finished these experiments demonstrating the compatibility of the lab-on-a-chip system with the MOD. "If you can't detect life in the Yungay region of the Atacama Desert, you have no business going to Mars," Mathies said, referring to the desert region in Chile where the crew stayed and conducted some of their tests. Mathies, who 12 years ago developed the first capillary array electrophoresis separators marketed by Amersham Biosciences in their fast DNA sequencers, is confident that his group's improvements to the technology utilized in the genome project will feed perfectly into the Mars exploration projects. "With the kind of microfluidic technology we've developed and our capability to make arrays of in situ analyzers that conduct very simple experiments relatively inexpensively, we don't need to have people on Mars to perform valuable analyses," he said. "So far, we've shown this system can detect life in a fingerprint, and that we can do a complete analysis in the field. We're really excited about the future possibilities." Bada, a marine chemist, is the exobiologist on the team, having developed nearly a dozen years ago a novel way to test for amino acids, amines (the degradation products of amino acids) and polycyclic aromatic hydrocarbons, organic compounds common in the universe. That experiment, MOD, was selected for a 2003 mission to Mars that was scrapped when the Mars Polar Lander crashed in 1999. Since then, Bada has teamed with Mathies to develop a more ambitious instrument that combines an improved MOD with the new technology for identifying and testing the chirality of the amino acids detected. The ultimate goal is to find proof of life on Mars. The Viking landers in the 1970s unsuccessfully tested for organic molecules on Mars, but their sensitivity was so low that they would have failed to detect life even if there were a million bacteria per gram of soil, Bada said. Now that the NASA rovers Spirit and Opportunity have almost certainly shown that standing water once existed on the surface, the aim is to find organic molecules. Bada's MOD is designed to heat Martian soil samples and, in the low pressures at the surface, vaporize any organic molecules that may be present. The vapor then condenses onto a cold finger, a trap cooled to Mars' ambient nighttime temperature, approximately 100 degrees below zero Fahrenheit. The cold finger is coated with fluorescamine dye tracers that bind only to amino acids, so that any fluorescent signal indicates that amino acids or amines are present. "Right now, we are able to detect one trillionth of a gram of amino acids in a gram of soil, which is a million times better than Viking," Bada said. The added capillary electrophoresis system sips the condensed fluid off the cold finger and siphons it to a lab-on-a-chip with built-in pumps and valves that route the fluid past chemicals that help identify the amino acids and check for handedness or chirality. "MOD is a first stage interrogation where the sample is examined for the presence of any fluorescent species including amino acids," Skelley said. "Then, the capillary electrophoresis instrument does the second stage analysis, where we actually resolve those different species and can tell what they are. The two instruments are designed to complement and build on one another." "Rich has taken this experiment into the next dimension. We really have a system that works," Bada said. "When I started thinking about tests for chirality and first talked to Rich, we had conceptual ideas, but nothing that was actually functioning. He has taken it to the point where we have an honest-to-God portable instrument." Amino acids, the building blocks of proteins, can exist in two mirror-image forms, designated L (levo) for left-handed and D (dextro) for right-handed. All proteins on Earth are composed of amino acids of the L type, allowing a chain of them to fold up nicely into a compact protein. As Mathies describes it, the test for chirality takes advantage of the fact that left-handed amino acids fit more snugly into a left-handed chemical "mitt" and right-handed amino acids into a right-handed mitt. If both left- and right-handed amino acids travel down a thin capillary tube lined with left-handed mitts, the left-handed ones will travel more slowly because they slip into the mitts along the way. It's like a left-handed politician working a crowd, he said. She'll move more slowly the more left-handed people in the crowd, because those are the only people she will shake hands with. In this case, the left-handed mitt is a chemical called cyclodextrin. Different amino acids - there are 20 different kinds used by humans - also travel down the tube at different rates, which allows partial identification of those present. "After amino acids are detected by MOD, the labeled amino acid solution is pumped down into microfluidics and crudely separated by charge," Mathies said. "The mobility of the amino acids tells us something about charge and size and, when cyclodextrins are present, whether we have a racemic mixture, that is, an equal amount of left- and right-handed amino acids. If we do, the amino acids could be non-biological. But if we see a chiral excess, we know the amino acids have to be biological in origin." The state-of-the-art chip designed and built by Skelley consists of channels etched by photolithographic techniques and a microfluidic pumping system sandwiched into a four-layer disk four inches in diameter, with the layers connected by drilled channels. The tiny microfabricated valves and pumps are created from two glass layers with a flexible polymer (PDMS or polydimethylsiloxane) membrane in between, moved up and down using a pressure or vacuum source. UC Berkeley physical chemist James Scherer, who designed the capillary electrophoresis instrument, also developed a sensitive fluorescence detector that quickly reads the pattern on the chip. One of the team's current NASA grants is for development of a next-generation Microfabricated Organic Laboratory, or MOL, to fly to Mars, Jupiter's moon Europa or perhaps a comet and conduct even more elaborate chemical tests in search of a more complete set of organic molecules, including nucleic acids, the structural units of DNA. For now, however, the goal is an instrument ready by 2009 to go beyond the current experiments aboard the Mars 2003 rovers and look for amino acids. "You have to remember, so far we have not detected any organic material on Mars, so that would be a tremendous step forward," Bada said. "In the hunt for life, there are two requirements: water and organic compounds. With the recent findings of the Mars rovers that suggests that water is present, the remaining unknown is organic compounds. That's why we are focusing on this. "The Mars Organic Analyzer is a very powerful experiment, and our great hope is to find not only amino acids, but amino acids that look like they could come from some sort of living entity."